A new British Airways Executive Club / Wine Explorer deal for Spring, with a generous first order bonus, has just been launched. BE AWARE – you are getting tied into something. Every 8 or 12 weeks and for Christmas, Laithwaites will contact you with details of a new case. If you do not specifically say that you do not want to receive it, either online or by phone, it will be sent to you and charged to the credit card you used for your initial order. The small print can be found here. Whether you want to go for this depends on how well organised you are. 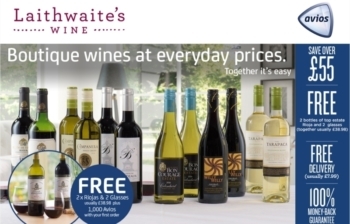 Overall, to be honest, it is a pretty good deal – 12 bottles of wine (+2 free bottles) at a bargain price, 1000 Avios and two wine glasses thrown in. I doubt the wine will be too bad, given that they want to encourage you to buy more. Do people find the pond water offered by these “12 bottles for £99” or so actually drinkable ? I was once a member of The Sunday Times Wine Club but way back then all I knew was red or white. A few recent attempts to illicit value from such clubs has only met with rubbish cheap wine sold cheaply. Couldn’t agree more. However I see they do an enprimeur service via their website, so they do have serious wine buyers but unfortunately I can’t see a way of getting bonus avios for buying the good stuff! I was very impressed with their enprimeur service last year (but yes, no points of course). Bought some unfashionable cote de rhone for a very reasonable price. Should be ready in another 8 years for my 40th! I did this last time. Wine was decidedly “meh”. Also never got the points, must chase that one. Has anyone else noticed that the Real Harry has been missing for a while in the comments – especially the wine and groupon articles. Hope you are ok Harry. I’m sure Squills is fine, and sense there’s a name change afoot! 🙂 . Is this open to those people who were previously members?